WHAT IS MY COMFORT FOOD? This is my first time joining the Girls Talk meme. I know I had enough of girl talk but least I realized this will be translated into a virtual gathering of girls around here, and finally having my first post for this meme. So today’s theme is all about comfort food, what is my comfort food? I teach Food Anthropology and one of the major topics discussed is comfort food, I don’t mean this post to be formal, but just a little backgrounder from its theoretical perspective. On a more casual manner, this kind of food is something that brings some sense of measure of consolation when eaten, a different level of ease and self-satisfaction, although most of the time, we associate it with sweets, chocolates, ice cream or desserts, comfort foods comes in its most suitable sense when we have a meal that is associated with culture or longingness over someone, place, smell, taste, event associated with the food…. That’s quite long …. So much for that! So, comfort food you say …. 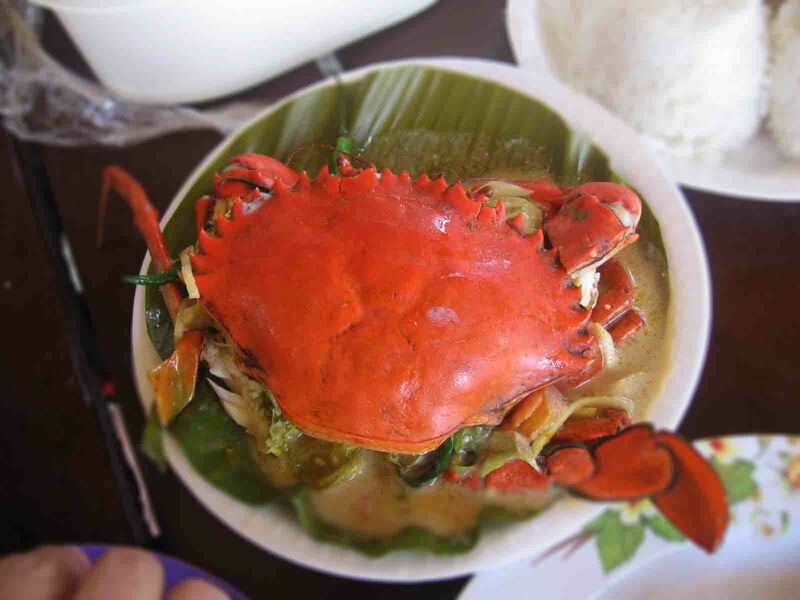 My moms ‘crab in spicy coco milk’, I’m no sweet tooth that’s why, our Sunday family affair is never complete without this. You should not miss family Sundays or nothing to pack to home. I don’t eat crab if it is not cooked by my mother, well, to be honest I don’t exactly know the process of cooking, all I know is that I have been cracking crab claws of this cooking fashion since time immemorial. But just to give you a modest idea what’s in this platter, a ‘bakla’ crab, don’t ask me how sexuality is determined in crabs my mom has strategy for knowing, she said its more ‘taba’, I know she dipped the whole crab in boiling water, my most detested part of the process, ‘kakang gata’, young coconut shreds, a lot of ginger, onions and garlic, bell pepper and a lot more pinches and dashes and put a handful of sili leaves just before serving …. Don’t ask me about the exact measurement, she cook by her five senses. So there!